I read this article and found it very interesting, thought it might be something for you. The article is called Aamir Khan’s Dream Of 8% (Of GDP) Healthcare Spend and is located at https://archive.indiaspend.com/sectors/aamir-khans-dream-of-8-of-gdp-healthcare-spend-66372. 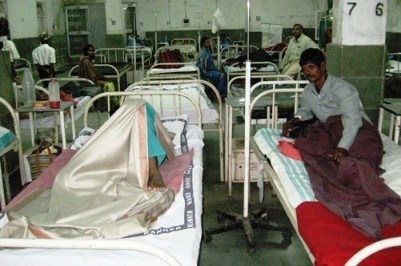 Healthcare budgets in India often attract criticism, if only for the lack of it. Only 20% of the total health expenditure in India is financed by the Union & State Governments, a meagre contribution compared to other developing nations. Out of pocket expenditure on health is more than 2/3rds of total health spend in India. Rural households account 62% of this. IndiaSpend’s Sourjya Bhowmick provides an India healthcare snapshot which looks at aggregate spends as well as the National Rural Health Mission (NRHM) – a `flagship’ scheme. The Department of Aids Control got its own budget from 2010-2011. This was preceded by the National Aids Control Programme which was under the Department of Health and Family Research. This year’s budget of Rs 34,488 crore is split amongst 4 departments. The Department of Health & Family Welfare gets Rs 30,702 crore. The department of AYUSH is budgeted Rs 1,178 crore this year, Department of Aids Control gets Rs 1,700 crore, Department of Health Research gets Rs 908 crore. The total healthcare spend for the last 5 years adds up to Rs 1,30,862 crore ($26 billion). A major chunk of which, (Rs 30,702 crore for 2012) goes to the Department of Health and Family Welfare. A recent television programme hosted by Bollywood actor Aamir Khan asked some tough questions on the state of healthcare system in general the practice of medicine in specific. So what’s the verdict on what has gone into healthcare in the last 5 years and the outcome? Before we come to that, let’s look at where India stacks up in terms of health expenditure against other BRICS (Brazil, Russia, India, China & South Africa) nations. *Approximate GDP data as on 2011 and Health Expenditure data as on 2009. NRHM falls under the Department of Health and Family Welfare. The stress on NRHM is evident from the fact that of the Rs 30,702 crore earmarked for the Department of Health and Family Welfare in Budget 2012, Rs 18,515 crore is for the NRHM. At the same time, it is observed that the three other departments of the Health Ministry do not get funded that much. Around Rs 3,786 crore is budgeted in totality to three departments this year. We earlier wrote about the challenges and achievements of NRHM. Interestingly, for all the scams and issues like absenteeism and shortfall in physical infrastructure, the NRHM has been the only ray of light in India’s healthcare scenario. The public funding of healthcare in India is around 1.4% of GDP. This issue is often discussed in the various documents of the Government and promises and importance of increasing the public expenditure is committed in every year’s Annual report. The budget increases every year, so does India’s GDP. However, public expenditure on healthcare remains largely the same. Bollywood actor Khan argued that healthcare spends should go upto 8% and even 9% of GDP. Maybe that’s not feasible. But even a 2% contribution seems a while away. Moreover, fixing leakages in current spend will help too. it should be every indians dream..